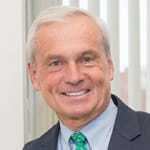 William J. Gilbane, Jr. is vice chairman of Gilbane Building Company and vice president of Gilbane, Inc. A leader in the company’s focus on exceeding client expectations and achieving operational excellence, he has served in numerous roles and leadership capacities during his 47-year tenure. As former president and COO, he was a driving force behind the company’s growth plans and had the executive responsibility for developing and fostering employee development through Gilbane University, an immersive training platform recognized by Training Magazine as one of the top learning organizations in the construction industry. Mr. Gilbane holds a bachelor’s degree in Political Science from Brown University. He is a current member of the Irish Famine Memorial Committee and the President’s Roundtable for the Rochester Institute of Technology and also serves on the board for the Rhode Island Reds Heritage Society.